A poster depicting a white supremacy pyramid which appeared on the wall of a charter school has parents and students upset. 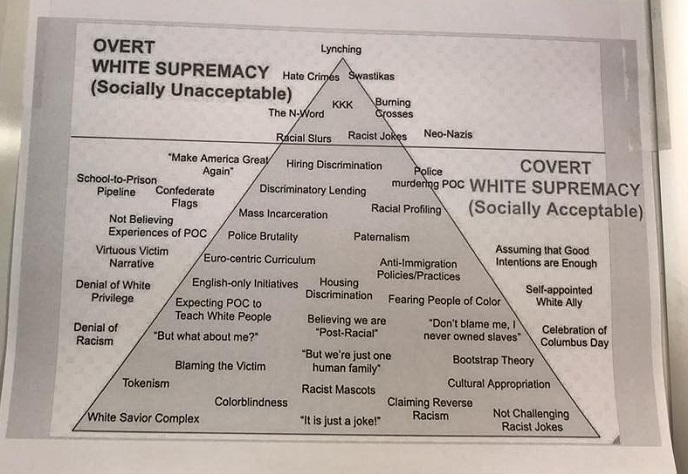 The white supremacy pyramid appeared on the wall in the classroom of Franca Gilbert, a French teacher at the Franklin Academy High school since 2007. According to Gilbert’s LinkedIn profile, she is the World Languages Department chair. Franklin Academy is a tuition free public charter school in the state of North Carolina, located in the Wake Forest area. Franklin Academy was the first in a set of charter schools created by libertarian minded Bob Luddy. He would later expand, creating Thales Academies. The white supremacy pyramid includes categories noted as Overt White Supremacy and Covert White Supremacy. Topics such as white savior complex, denial of white privilege and “make America great again” are included in the pyramid. The origin of the pyramid traces back to a Colorado based group called the Safehouse Progressive Alliance for Nonviolence. This pyramid was part of the group’s, “Building a Multi-Ethnic, Inclusive & Anti-racist Organization: Tools for Liberation Packet for Anti-Racist Activists, Allies, & Critical Thinkers” which first was produced in 2005. Digging further, the original pyramid seems to gave been adapted by a woman named Ellen Tuzzolo sometime in 2016. Tuzzolo was last known to work as a Program Director at a non-profit called the Discovery Center, which is now closed. It remains unclear where Franca Gilbert obtained a copy of the white supremacy pyramid poster. Parents of students at the school tell American Lens that the white supremacy pyramid was displayed in the classroom for at least a week. Students and parents also tell American Lens that Gilbert often makes derogatory remarks about President Trump and says ‘what a horrible person and president’ he is. Students and their parents complained to the administration about the openly hostile and politically charged environment Gilbert had created in her classroom. Once complaints started to roll in to the administration, allegedly the school put Franca Gilbert on a one day suspension. Since the incident, parents tell American Lens that a notice was sent out to all staff from the administration. That notice reminded teachers that promoting personal political commentary and opinions in the classroom was not permitted. One student reported that teachers in multiple classes addressed the students about the Gilbert incident by saying that ‘they were no longer able to talk freely’ and added that this was ‘thanks to the students who complained’. The parent added that they are actively looking for a new school due to this “mind-boggling piece of social justice crap” that was forced onto their child and the subsequent alleged ostracizing of students who had spoken up about it. American Lens reached out to the administration at Franklin Academy, but our request for comment was denied. “Per our policy, we are unable to comment on personnel matters at our school. Our administration is appropriately addressing any issues that may arise,” wrote James Kornegay, Site Administrator Grades 9-12. American Lens resent a request for information in the form of a Freedom of Information Act (FOIA) request. Franklin Academy is a public charter school and is required by law to respond. We asked for confirmation of Gilbert’s employment, that she teaches French, any email exchanges regarding the alleged white supremacy pyramid incident and for a copy of Gilbert’s course syllabus. As of the publishing of this article, none of the officials at Franklin Academy had responded to this FOIA request. According another report, the white supremacy pyramid is not a lone incident. Apparently, students taking Honors Earth Science were at one time given a questionable reading assignment: The Last Hours of Ancient Sunlight by Thom Hartmann. Hartmann’s book was allegedly inspired by actor Leonardo DiCaprio’s movie on global warming called “Before the Flood.” The movie was not as well received as hoped, as it mainly was filled with hype, inaccuracies and half-truths. A Google search of the author showed that Hartmann is neither a scientist nor a historian. Instead, he is a former psychotherapist and a self-described Progressive activist. Hartmann has admitted to being a member of the Students for a Democratic Society, a radical organization established in the 1960’s which was at one time headed up by Weather Underground domestic terrorist, Bernadine Dohrn. Hartmann is also a commentator employed by Russia Today (RT), a state-sponsored media wing of the Russian government. The special event was produced with help and backing from major liberal groups such as the Campaign for America’s Future, , MoveOn.org. All of these groups are heavily financed by George Soros. This article first appeared at American Lens News on September 9, 2017. This entry was posted in #SJW, Am Lens, EDUCATION, Parental Rights, Poltical Correctness, Resistance, Social Justice and tagged Franca Gilbert, Franklin Academy, White Privilege, White Supremacy Pyramid. Bookmark the permalink.